We think shares of TerraForm Power, Royal Dutch Shell, and Cheniere Energy Partners are all worth putting on your radar. Despite all the talk about the nearly decade-long bull market and North America's transformation into an energy powerhouse, energy stocks haven't performed incredibly well over the past couple of years. For those looking for quality companies selling for relatively cheap prices, though, energy is a great place to look right now. So we asked three of our Motley Fool contributors to each highlight a stock they see as a great buy now in the energy industry. Here's why they picked TerraForm Power (NASDAQ:TERP), Royal Dutch Shell (NYSE:RDS-A) (NYSE:RDS-B), and Cheniere Energy Partners (NYSEMKT:CQP). Matt DiLallo (TerraForm Power): In June, renewable energy giant Brookfield Renewable Partners made another big bet on the future of TerraForm Power by increasing its stake in the company from 16% to 30%. Brookfield boosted its interest in TerraForm to help provide it with the funding for the acquisition of a wind and solar company in Western Europe. That assistance aside, there was another driver of the deal, which is that Brookfield firmly believes the market had undervalued TerraForm and was happy to pick up more shares at a discount. That belief still holds true and was evident in the comments of CEO Sachin Shah on Brookfield's most recent quarterly conference call. Shah stated, "we were happy to be a large buyer of its stock." He noted that while: "other public shareholders don't have or share a similar view of value in the company... from our perspective, it has a very attractive valuation, and we think that it has a significant amount of room to run and it could be a great vehicle to use to help us continue to grow." In addition to that long-term upside potential, another thing that makes TerraForm a great buy right now is its dividend. Not only does the stock currently offer an attractive 7.3% payout but the company expects to increase it at a 5% to 8% annual pace over the next five years. That income and upside put it at the top of my energy stock buy list right now. Jason Hall (Royal Dutch Shell): An interesting thing has happened in the world of supermajors: ExxonMobil is on track to lose its status as the world's biggest publicly traded oil company, while its big oil peer, Shell, has become the ascendant heir. This is a remarkable reversal from where these two were only a few years ago. How'd this happen? It's largely a product of timing, but also an incredible job by Shell's management to make the most out of a huge acquisition and significantly improve its asset base, while ExxonMobil has muddled along in recent years and only recently enacted a plan to spur its profits that will take several years to pay off, and could actually cause its cash flows and earnings to weaken in the near term. Shell, on the other hand, has already taken many of the cost-cutting and production-growing steps ExxonMobil has only just begun, sending its profits surging. 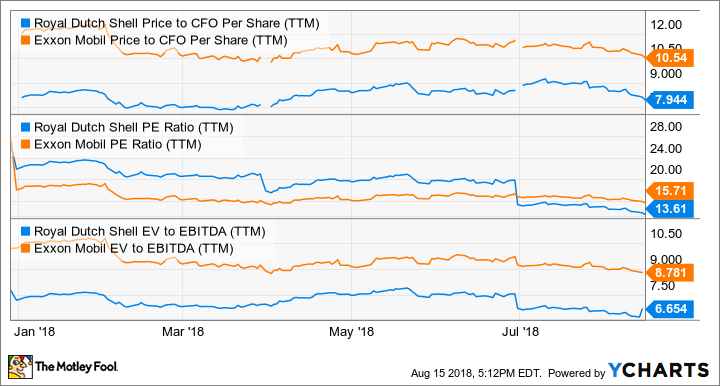 RDS.B Price to CFO Per Share (TTM) data by YCharts. That's due in part to a recent swoon that's seen Shell's stock price fall 16% from its peak, far more than most other oil majors. But it's created a timely opportunity to buy what I think is the best of the supermajors at the best value at which it has traded for most of 2018. Lastly, Shell's dividend yield is above 5.8% at recent prices, making it an excellent long-term income stock as well as a solid value today. Tyler Crowe (Cheniere Energy Partners): When parent company Cheniere Energy announced its intentions to convert Cheniere Energy Partners' Sabine Pass LNG import facility to an export terminal, most of Wall Street thought management was out of its mind. Today, though, exporting natural gas via LNG export terminals seems almost like a no-brainer investment. Based on Cheniere Energy Partners' most recent earnings results, it's pretty clear that it is a lucrative investment that should generate a steady income stream for years to come. Even though part of the partnership's Sabine Pass facility was down for scheduled maintenance for the quarter, Cheniere Energy Partners produced another solid quarter that allowed management to raise its distribution to shareholders to $0.56 per share, which is a 6% yield today. That distribution is supported by take-or-pay contracts for more than 85% of the facility's production capacity and largely insulates Cheniere from commodity prices. These contracts should ensure the partnership will be able to maintain this payout for several years down the road. At the same time, there is a good chance that we will see a significant increase in Cheniere's payout next year as it brings its fifth natural gas liquefaction process train into full service. The new train will boost output of the facility by 20% and should help bring in a lot more cash for further payouts. Management even noted that it has received all the necessary permits for an additional sixth process train and expects to make a final investment decision once commercial contracts are finalized. Because of the predictable nature of Cheniere Energy Partners' business, investors can expect a relatively stable, high-yield income investment. If that is an attractive value proposition for you, then this LNG export company is worth a look.